A few weeks ago, we spent a long weekend in Montréal, Québec visiting a dear friend I grew up with. We stay close despite the many miles between the places we live. We enjoyed our little get-away immensely. We balanced our time between catching up with my friend and her husband and getting to spend time with their two darling, sweet, smart and loveable little boys, and seeing some sights around a vibrant French city in my home country. The best meals we ate over the long weekend were in my friend’s home. My friend is an omnivore, and her husband is vegetarian, and they are conscious of eating healthfully. We dine well together. I was so busy being entertained by the two little guys at the table that I didn’t remember to whip out my camera during those meals, so, a fabulous Quinoa and Beet Salad, Roasted Pork Tenderloin and the best Indian food we’ve ever eaten will have to live on in our memories. 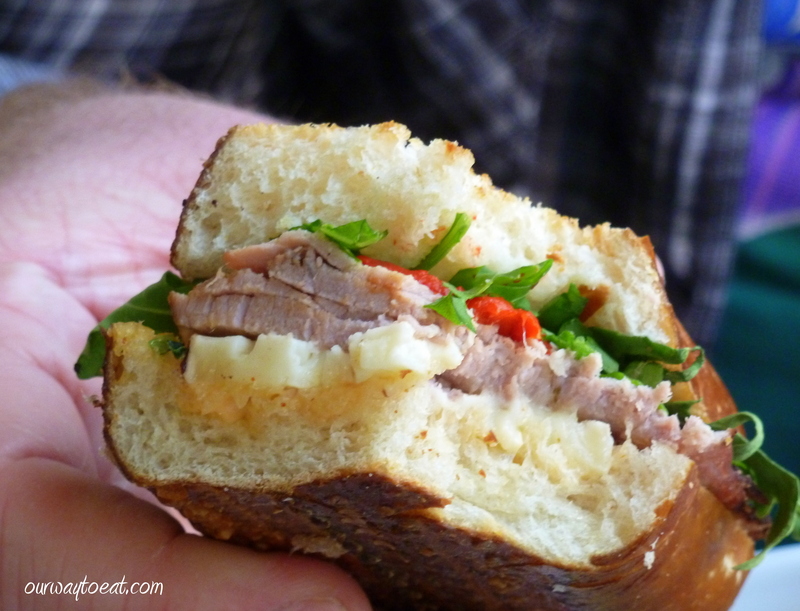 We happened upon a few tasty bites when we went out exploring, and so I will share a little peek at what we saw and ate around the city. This is my second visit to Montréal, and Bjorn’s first. The first afternoon of our visit we set off wandering from the campus of McGill University and headed toward the Old Town of Montréal. It turns out this colourful building, which could be a museum of modern art, is in fact a convention center known as Palais des congrès de Montréal. It also contains shops, restaurants and a metro stop. What a surprising structure to house a convention center. 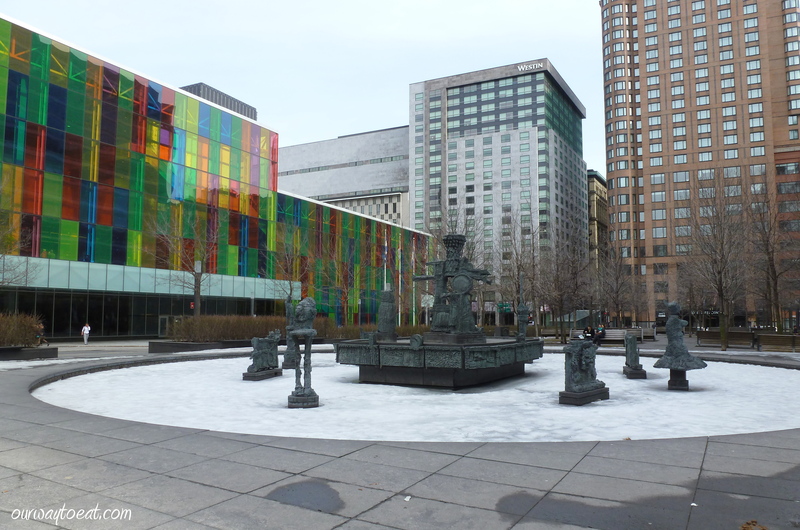 It serves a vital purpose in the city, and the higher cause of being public art. We didn’t have to wander long before we became thirsty and peckish. I had a short mental list of things to show Bjorn and for him to try in Montreal. 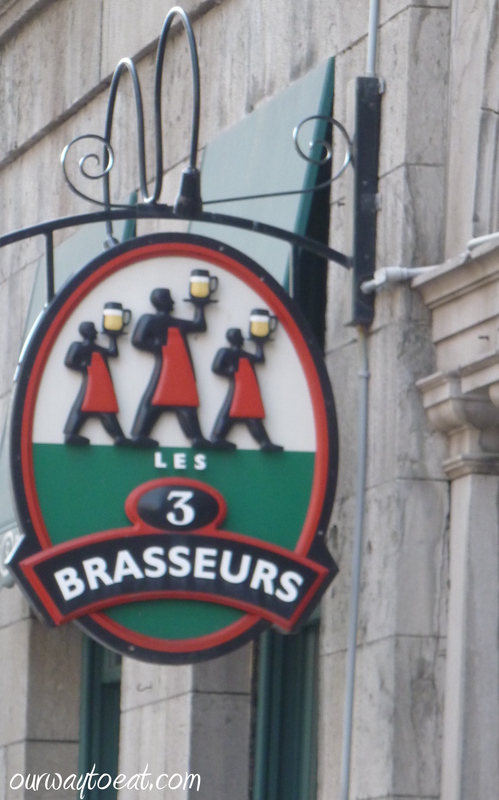 Trois Brasseurs in Old Montréal, or Vieux-Montréal, if you are local, was a good place to check Poutine off the list. 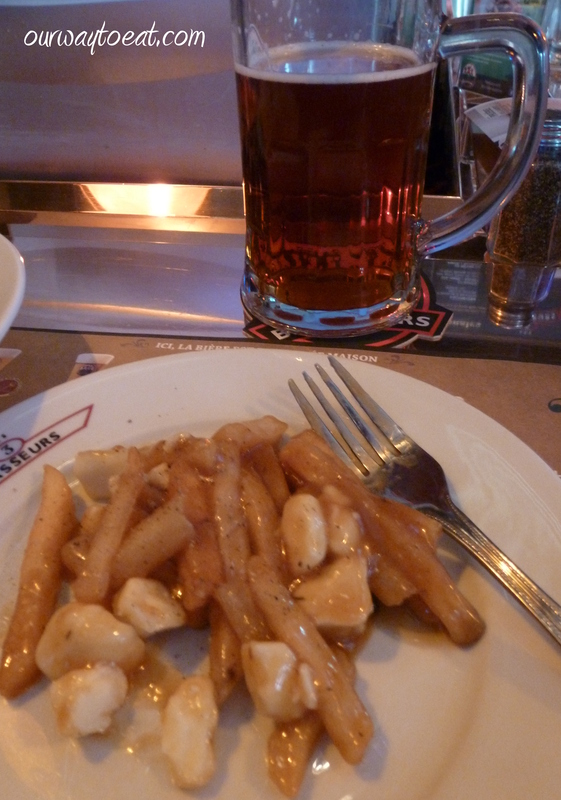 Poutine, which consists of French fries, topped with cheese curds melted by gravy goes very well with an afternoon beer. 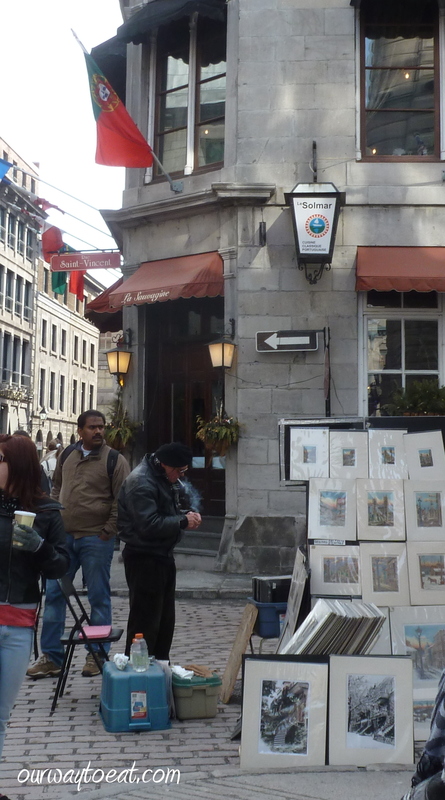 We wandered our way through Vieux-Montréal, and stopped to buy a print from a gentleman with a temporary stand set up at the corner of Rue Saint-Vincent and Rue Saint-Paul. We live in Saint Paul, so we thought a picture of this street corner was a perfect souvenir. We will add it to a little framed collection of art that we have purchased from similar street-corner stands in Czech Republic and Italy on display in our house. I have learned to buy the souvenir I want right away when I see it. When I put off buying it, I never come across what I want again. The City of Montréal holds a parade in honour of Saint Patrick’s Day, the day after Saint Patrick’s Day. Our city, Saint Paul, Minnesota is a very Irish and Catholic city, so I am used to a pretty big celebration of this day. Montréal does it big too. The parade goes on for hours, and is a massive party, to say the least. We spent a few hours at the parade with my friend, her parents, and her almost three year old who loves marching bands. We were all satisfied after twenty-or-so marching bands and a few hundred floats went by and so my friend and her parents headed home for nap time and Bjorn and I headed out for lunch. We ended up at a bistro. 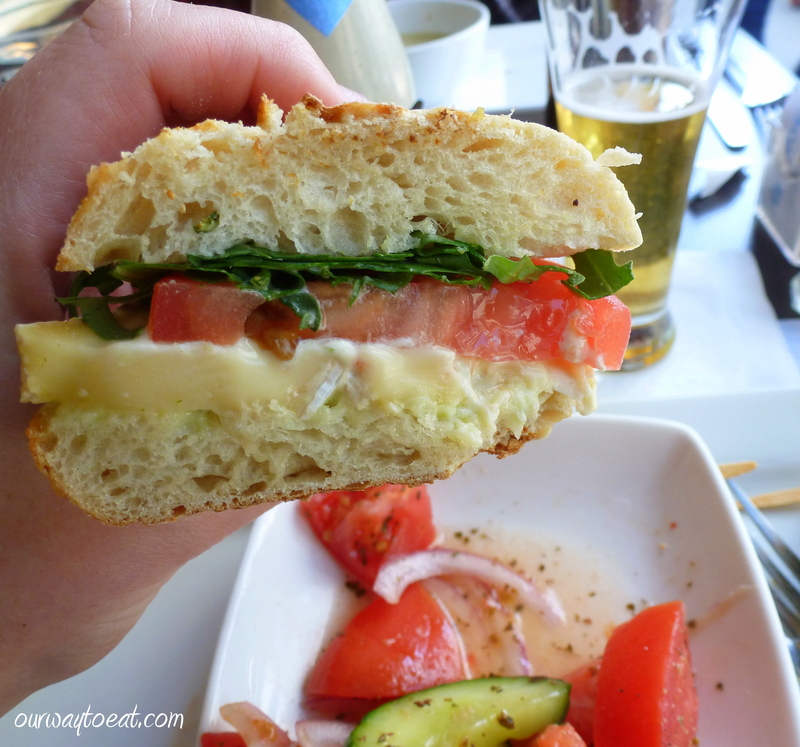 I had a “Caprese” sandwich on a baguette with salad made of a tomato, cucumber and red onion. The unique twist on the caprese was that it contained brie instead of fresh mozzarella. So very French. 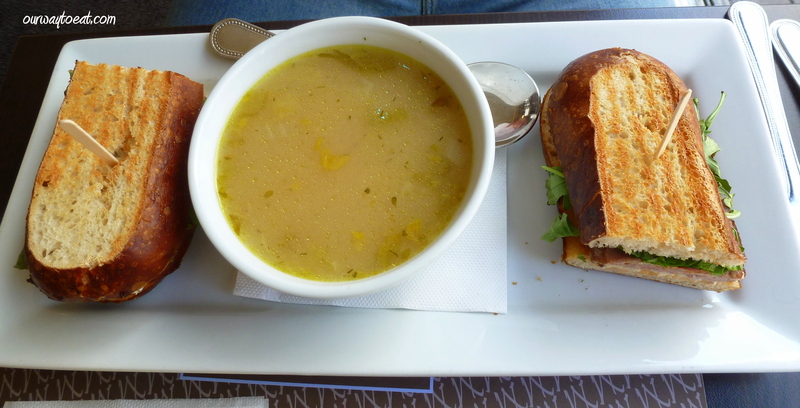 Bjorn had a roast beef panini and a bowl of chicken noodle soup. No, it doesn’t look terribly exciting, but it was a totally solid, satisfying lunch. When we are travelling and have no idea where we are going and we end up with a lunch of baguettes and paninis with brie, we’re doing alright. Lunch revived us. We headed toward le Musée des beaux-arts de Montréal. Montréal seems to have art on every street corner for the enjoyment of the public. 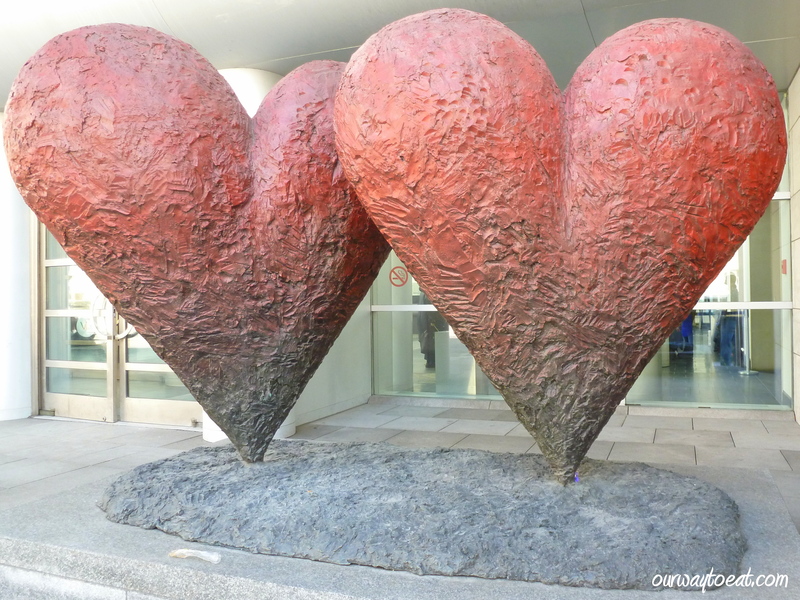 Just above is Coeur Jumeax, a sculpture by Jim Dine. 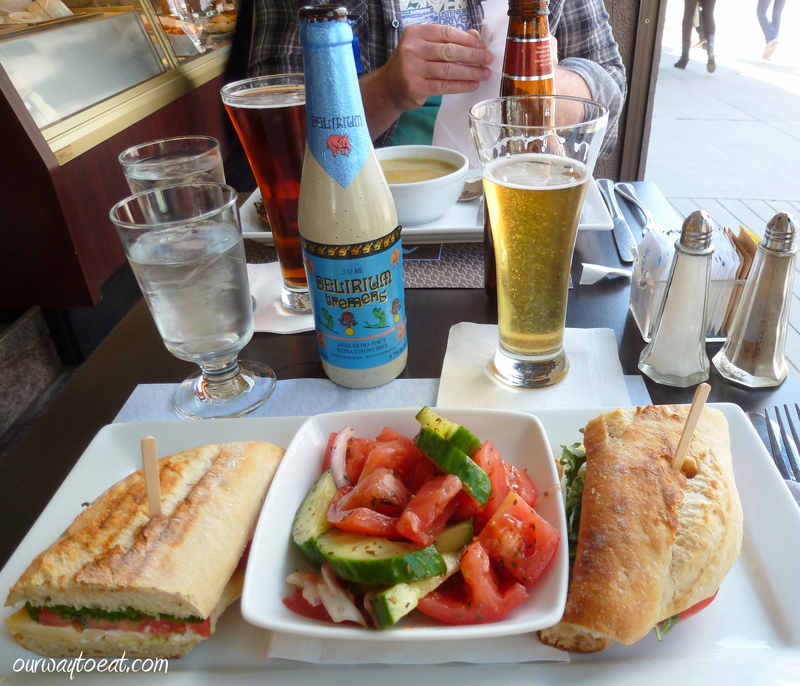 After taking in the Musée des beaux-arts, we were thirsty, and so we stopped in to a little shop to buy something to drink. What a place! 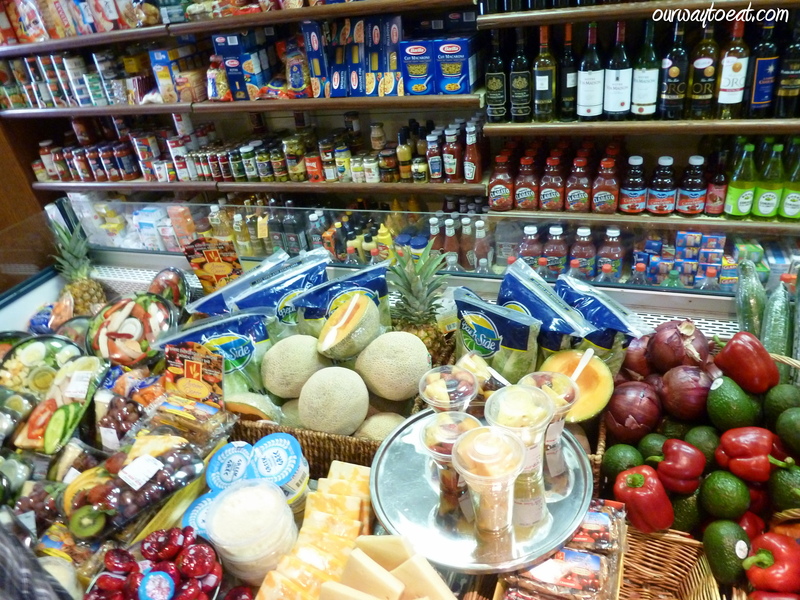 I could not believe the variety of all manner of prepared foods, produce, dry goods and wines that lined the shelves in this tiny, urban grocery store. The coolers and shelves were positively packed with salads, sliced vegetables, plates of fruit, Babybel cheese, marble cheese, greek yogurt, cups of sliced fruit, and cantaloupe sliced in half, and wrapped in saran wrap with plastic spoon all ready to be grabbed and eaten on the go. The place was packed with people, so I had to move fast which is why the pictures are a bit blurry. 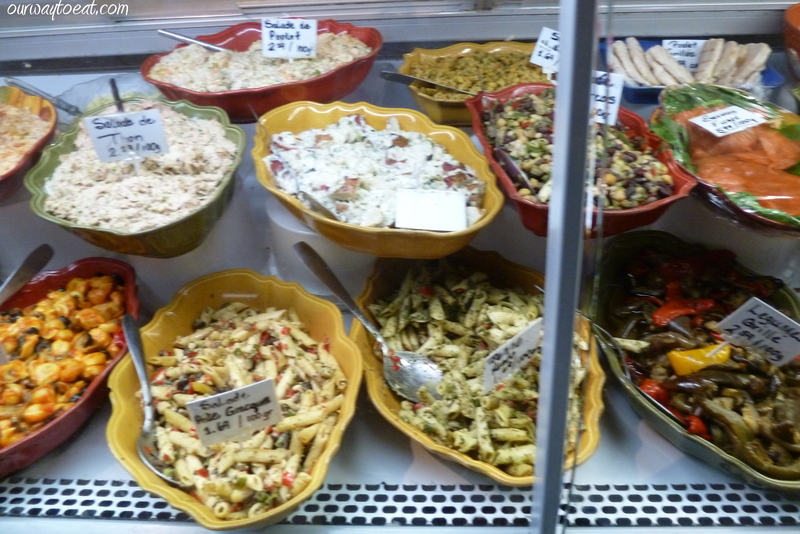 Behind a deli counter, there were colourful bowls containing a marvelous variety of salads: top left, salads de Thon (Tuna), front left, Salade Greque (Greek), and front right, Legumes Grille (Grilled Vegetables). Also behind the deli counter, there were bowls of hard-boiled eggs, sausages, Salad D’Orizo Epicée (Spicy Orzo Salad), and baguettes and bagels prepared with dinde et fromage (ham and cheese) and saumon fumé (smoked salmon) all of which were selling like hotcakes to the masses of people recovering from Saint Patrick’s Day parade revelry. Clearly, this store exists to meet a need in this neighborhood. It appears that real, ready-to-eat food is a go-to meal of choice for Montréal’s many University students and bankers who are natural regulars in this neighbourhood. I sometimes daydream about being a proprietor of a general store with a lunch counter. There may not be enough foot traffic to support a store like this in my neighbourhood, but it is fun to see a city that depends on independent neighbourhood grocery stores. Montréal feels European. Every day in Montréal we managed to find some high place to climb. 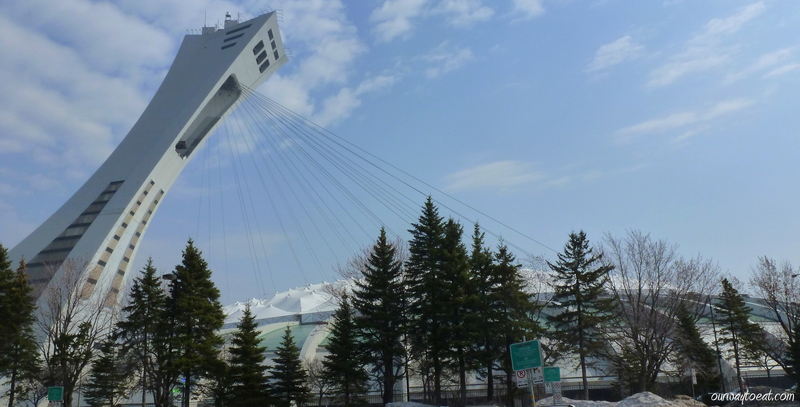 One day it was Mont Real, the next was up the shaky elevator shaft in Stade Olympique, or Olympic Stadium, constructed for the 1976 Olympics. It felt like we stepped into an anachronism visiting Olympic Stadium, which sits seemingly untouched, unused and un-updated since the late ’70s. 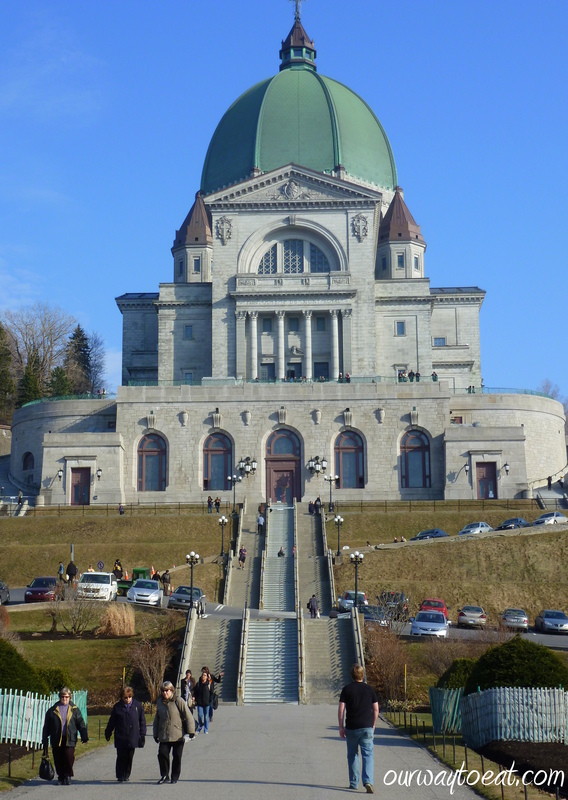 The final high point of the trip elevation-wise was up the steps to visit the impressive Saint Joseph Oratory, or Oratoire-Saint-Joseph du Mont Real and its grounds. As you can see here, Bjorn was determined to get a head start. 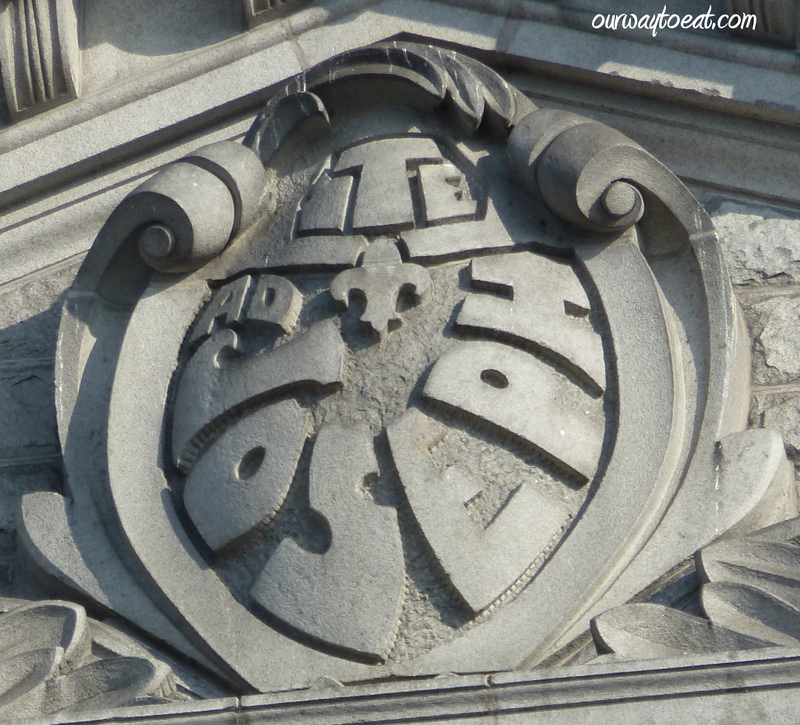 We thought the insignia on the facade of Oratoire-Saint-Joseph above the entrance also seemed anachronistic being so modern in the context of an immense old building. Perhaps it was added closer to the building’s completion in 1967, not in 1924 when construction began. Another must-try food item on our list was a pastry. 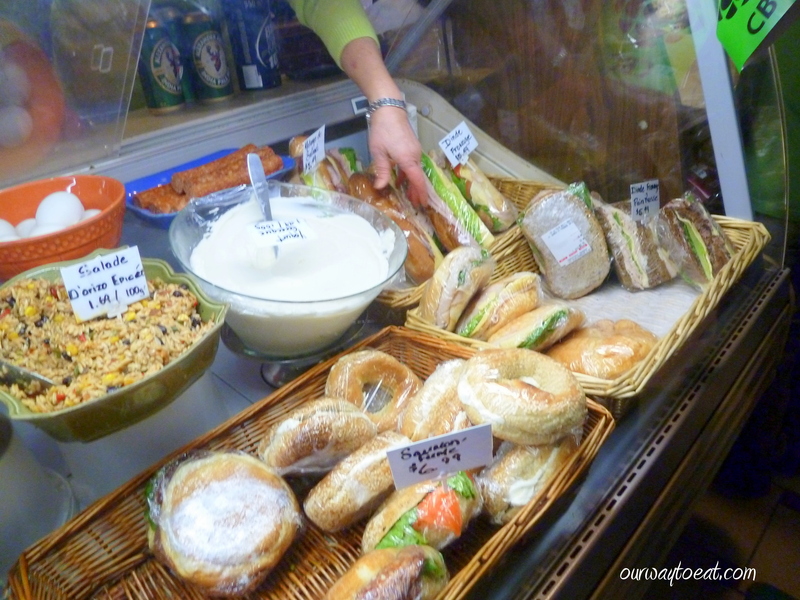 Along with neighbourhood grocery stores, it seems like there is a quaint boulangerie on every block. 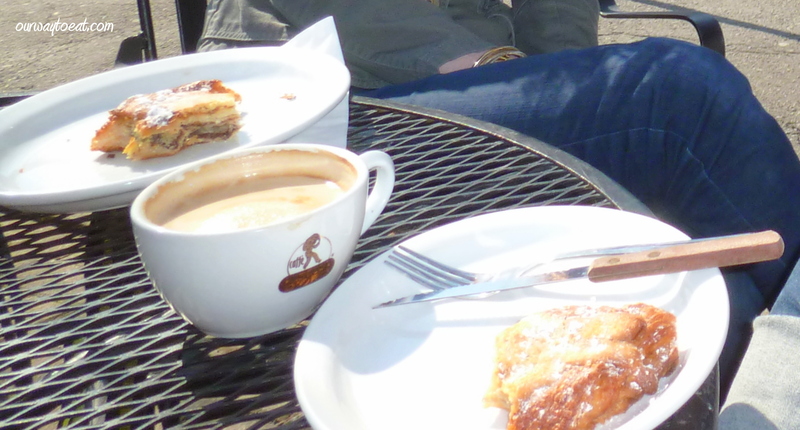 We enjoyed some delicious pain au chocolat and almond pastries with a latte at Au Pain Doré, a really nice boulangerie near my friend’s house. 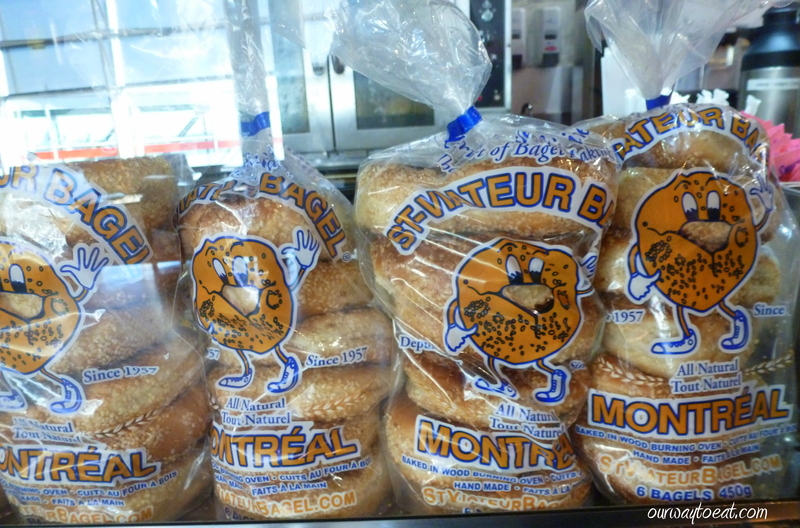 Also on the Montréal food “To Do” list was bagels. We grabbed some sesame seed bagels with cream cheese just before we boarded the plane to go home. We didn’t make it to one of the “must visit” bagel shops, but the bagel we found was still way better than average*. Our visit to Montréal was so nice. It was a refreshing little get-away. We struck the perfect balance of friend-time, and seeing new streets. 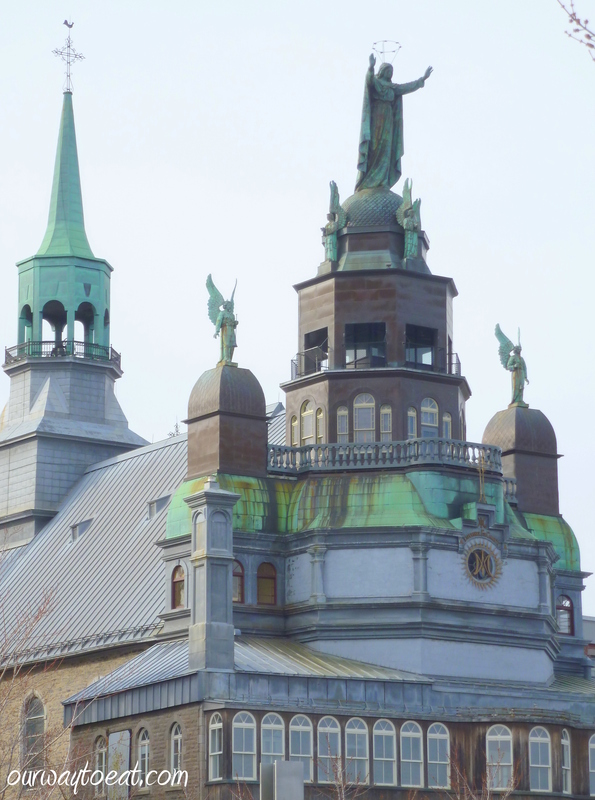 I highly recommend a visit in conjunction with a trip to Quebec City as a great two-stop tour of French Canada. *And that is saying something. I didn’t even eat mine until lunch time at work the next day.